The professional and experienced plumbers at WA Assett provide services in Perth and in surrounding areas including emergency plumbing services. With over 40 years of experience in Western Australian plumbing, no job is too big or small! From dripping taps, blocked drains, hot water systems, whole home filtration systems through to design and planning of new systems, WA Assett is now your solution for all your plumbing and gas needs. We are located centrally in Bayswater with our team spread out across the Metro area. Our friendly staff are able to quote on any of your commercial, residential, service or maintenance needs, dispatching a qualified technician to fix, install or service your plumbing or gas promptly and to the highest standard. Our mission is to provide unbeatable service through modern practices that are efficient and reliable by maintaining a highly skilled team with experience and passion for plumbing and gas. Our vision is to deliver 24/7 market-leading service to commercial and residential clients who value professional installs and maintenance of the highest standard. 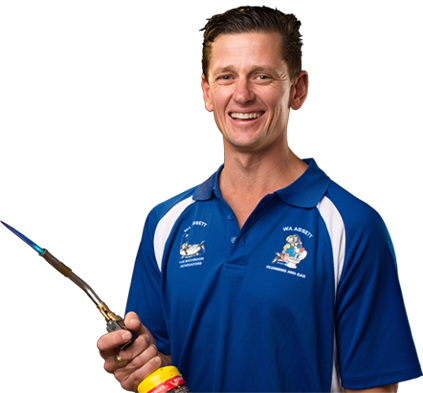 With only qualified professionals on the team, we aim to be one of Perth’s most reliable and successful plumbing and gas businesses. We thrive on strong relationships with our clients in order to foster trust through successful repairs and services. The WA Assett team is made up of a diverse range of licensed experts who love what we do! Established in 2013, we’ve managed to develop a strong presence in Perth through loyal relationships between our employees and clients. We pride ourselves on professionalism and reliability, as well as displaying exceptional customer service because we know our clients put their trust in us as experts in the field. We’re committed to modern practices to ensure maintenance is effortless following instalment or repair. Health and safety are of utmost priority to us and our team are trained to adhere to trade policies and practices. We practice innovative techniques and methods using the most up to date tools and products in the trade in order to ensure the best quality workmanship.